Pickled Red Onions are super with Mexican food like tacos, in salads, maybe on a sandwich, a burger, a dog or in a grilled cheese. They’re cool & crunchy and refreshing and a perfect foil for all kinds of things. I served them up the other day with my Instant Pot Chicken Tinga, and since they last for weeks in the fridge, I’m probably going to be putting them on just about everything. 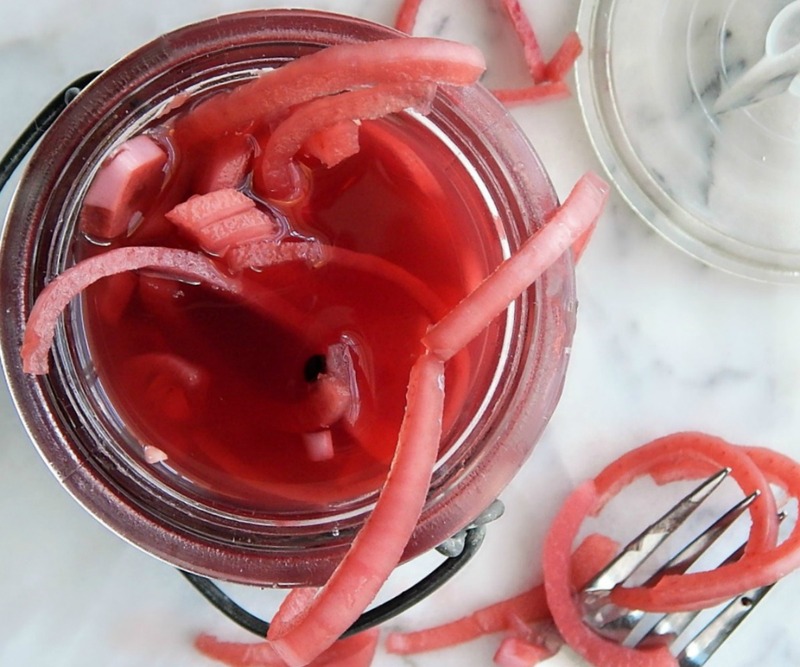 Super easy to make, Pickled Red Onions are almost a cheat. Put sliced onions in a jar, mix up enough brine to cover and wait. That’s the hard part, the wait! Several hours is good, but they just keep getting better and better. How often do you have a part of a red onion laying around in your fridge? Red onions can be huge and recipes usually call for just a little – pickling them can transform them from potential waste to a fabulous little condiment with just a few minutes of time. Place the sliced red onion in a very clean mason jar. In a small pot, heat the vinegar and add the remainder of the ingredients. Bring to a boil, stir to dissolve the sugar and salt and remove from heat. Pour the hot mixture over the red onion, adding more vinegar if needed to completely cover the onions. Cover, shake and set on the counter for an hour or two then refrigerate. The onions will begin to soften and turn a beautiful hue after several hours and continue to improve over time. I’ll be posting this recipe at Fiesta Friday. If you’re a food blogger, join in – Angie has a great group of bloggers joining her every week. If you’re just visiting, click on the link and see all the best of the Fiesta Friday food bloggers this week! This entry was posted in Click here for Fabulous Food Posts and tagged Brine, Condiments, pickled red onion, pickles, Red onion, Vinegar. Bookmark the permalink. Have to have a jar of these in my fridge! And I have a lone red onion that needs eating, perfect. Hi Liz – I keep finding more and more things to do with these! Love this Mollie and great photos too – I’ve been roasting the red onions prior to fermenting too – check out my post from a couple of weeks ago as I’d think you’d like that method too! Oh gosh, Laura, I just saw your comment from June!! I love the idea of roasting red onions for pickling! Yes Mollie – something I’ve done a few times since experimenting back in June…. I love your fabulous somethings recipes! I have a whole folder-full saved up! Just had to buy a whole bag of red onions instead of just the 1 onion I needed so I’ll be trying your version of pickled onions Mollie. I like the cumin seeds in this recipe. I don’t know if I’ve had these. I love pickled eggs though. I’d probably like them. I have never had pickled eggs!! I have seen them at gas stations and out of the way roadhouse type bars but always been afraid of them. I might have to make them now just to try them. Do you have a great recipe? They are so easy. Just put a can of red sliced beets with juice per six eggs (hard boiled peeled) with one cup of apple cider vinegar and celery seed. Let sit three days. Use a tall container so eggs are covered. I love them. Now I’m thinking I should post this! I love how the water turned out to be this such pretty color. I will be making this for my sandwich. 😀 Happy FF & I hope you are enjoying your weekend, Mollie. I love pickled red onions! And yes, they are a snap to make. I *almost* made some to go with the Chicken Tinga tacos I made for the cart the other night, but ran out of steam. But I still sold a lot of them! Thank you for the inspiration! Oh yum, aren’t those just yummy? Love the jalapenos with it too. I’ll have to go find you on FB! Is that your personal page or blog FB page? I put it on my personal page, which might be private…I can’t seem to keep track, lol! Then Frugal Hausfrau has a page, too.